Electric car maker Tesla (s TSLA) isn’t the only company looking to build a massive factory in an attempt to upend an industry. SolarCity (s SCTY) announced on Tuesday that not only is it buying up a company that makes solar hardware — for the first time moving into solar manufacturing and becoming even more vertically integrated in the solar industry — but that it plans to build one of the world’s largest (1 GW) next-gen solar manufacturing factories in Buffalo, New York, which one day could be expanded into the world’s largest of its kind. If SolarCity’s playbook sounds familiar, that’s because it is. Well, kind of. Tesla is building the world’s largest lithium ion battery factory somewhere in the U.S., in an attempt to lower the costs of the batteries in its cars — and thus the price point of those cars. Tesla is also trying to ramp up its production, and its biggest constraint right now is the current supply of lithium ion batteries in the world — so they gotta build their own. SolarCity panels on a Walmart, courtesy of SolarCity. A similar constraint is being placed on SolarCity, and the solar company also is trying to meet a certain cost reduction point. Elon Musk — who is both chairman of and a major investor in SolarCity, and the CEO and a big backer of Tesla — said on a media call Tuesday morning, “We were quite concerned. Three years down the road, there will not be enough panel production to supply SolarCity’s needs.” Musk says eventually SolarCity will need a supply of 10GW of solar panels per year (it just blew through the 1 GW total installed point, and is predicting another 1 GW in 2015 alone). SolarCity can also reduce the total costs of the end solar system by making its own panels, because that cuts out the added costs that go to the margins of the third-party solar maker, like sales, marketing, and shipping. With its own manufacturing SolarCity’s costs will be lower (after the return on investment period) and the company will drive more revenue, so the overall margin with vertical integration will be higher, SolarCity CTO Peter Rive told me. Verticalization means that a company owns the supply chain, or parts of the supply chain, for the product it sells. Depending on how vertically integrated it is, it can own everything from a product’s basic parts to its assembly, marketing and sales. 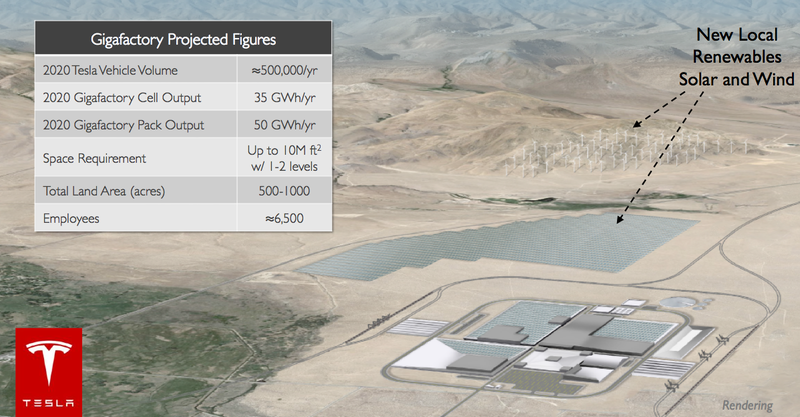 Info and artists rendering of Tesla’s battery factory. Image courtesy of Tesla. Likewise, Tesla is looking to go as vertical as possible. Its massive battery factory will be built like “an industrial park under one roof,” Musk said on an earnings call in May. Panasonic will likely produce the battery cells in the factory (Tesla now has a signed letter of intent from Panasonic), and then other companies would work in the factory and produce the anode, cathode, separators, and feed them to Panasonic. Tesla would produce the battery packs and act as a sort of landlord. But Musk is also eying an even more vertical strategy for Tesla. He said on the same earnings call that Tesla is in conversations with nickel-mining companies about trying to reduce battery cost components from the mining side. Musk joked in the call that the mining companies were really happy to talk Tesla because no one ever calls them. 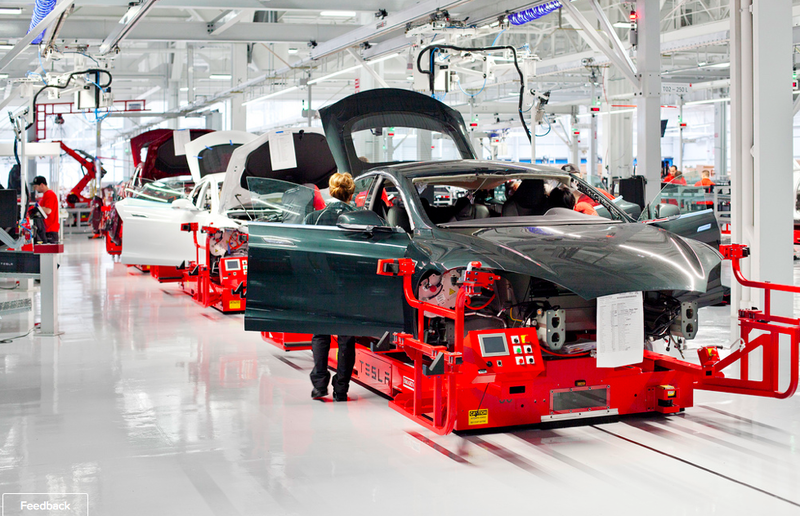 Tesla factory floor, image courtesy of Tesla. Of course, SolarCity and Tesla didn’t invent vertical integration. Sam Jaffe of Navigant Research noted to me in an email recently that Japanese car companies have a long history of investing in vertical integration for materials supplies. Toyota has made investments in the past in rare earth mineral mines in Vietnam and lithium extraction in South America. In the U.S., Henry Ford’s River Rouge plant was a complete vertical integration attempt that included steel mills and rubber refineries. “The North American automobile industry has long since abandoned vertical integration as a strategy. 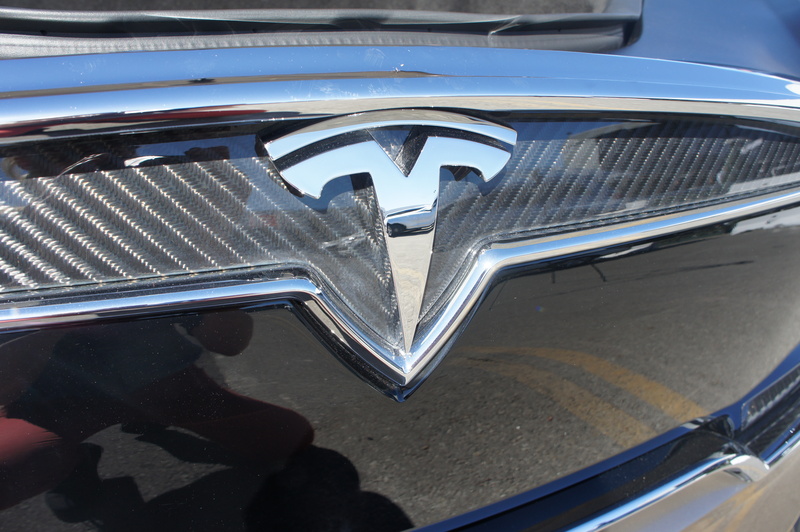 Musk is revisiting it,” writes Jaffe. Disrupting the automotive and electricity industries isn’t just about vertical integration. It’s also about scale. 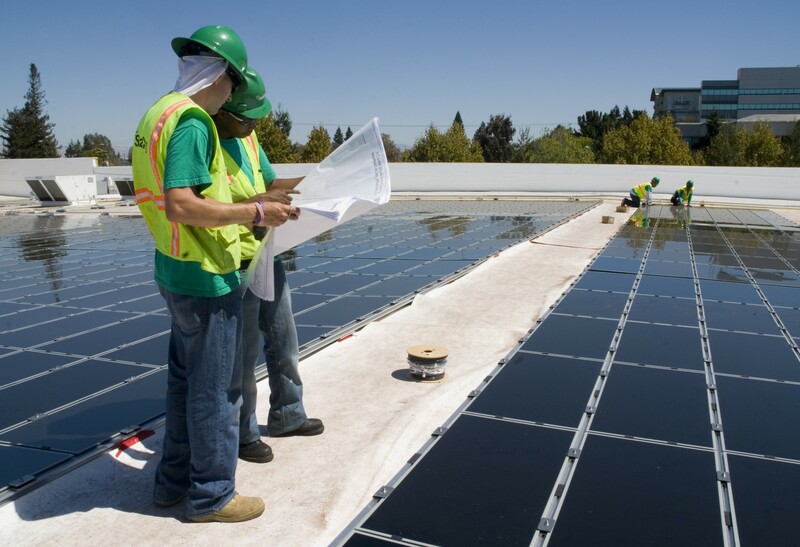 SolarCity’s factory could eventually be the world’s largest. Same with Tesla’s battery factory. Obviously, SolarCity and Tesla are using different strategies to reach this scale and vertical integration. As noted above, Tesla plans to work with partners like Panasonic on its battery factory, given Panasonic and others have been making lithium ion batteries for decades. SolarCity won’t be including those types of partners for its factory. SolarCity has decided to use M&A to buy its way into hardware vertical integration, and then will invest in scaling out Silevo’s technology. SolarCity will also invest in R&D in the technology, which is about seven years old. 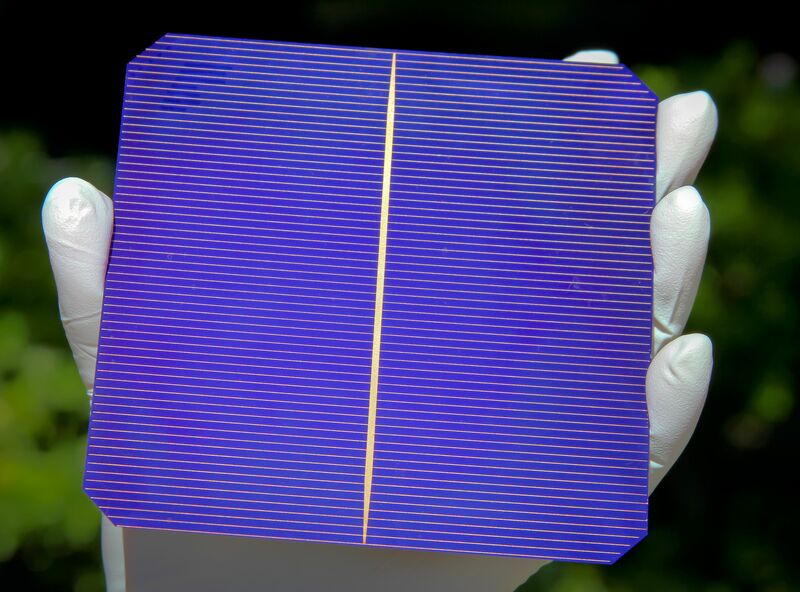 Rive told me that Silevo was transitioning from being a startup to being a commercial-scale solar cell maker when SolarCity bought it. The different strategies shed light on the stages of maturation of the battery and solar sectors. Batteries have been a commodity for decades, and Tesla seems confident that a large battery maker is now producing the best tech for the lowest cost. Solar panels are also a commodity, but more efficient panels have long cost substantially more than the standard panels. Sileva’s tech is high efficiency but low cost. SolarCity and Tesla also have the advantage of not only sharing investors and executives, but also being able to partner on technology. Tesla can supply its batteries to provide energy storage for SolarCity’s solar panels, and they can team up on marketing, sales and installation. If both SolarCity and Tesla are wildly successful, Elon Musk (and shareholders) would own the next generation of clean power technology and electric cars. Maybe that would be like the equivalent of owning Ford and Exxon at the same time. SolarCity can sell the electricity and Tesla’s cars and batteries can use and store it. Musk is already very wealthy from his early investments, and it’s likely he could get much more wealthier off of the coming energy transition. And while, yes, it is about business and money, Musk also maintains that it’s about fighting climate change. I believe him. He’s just found a very lucrative way to lead that disruption. Verticalisation – a new word for what businesses have been doing for centuries. Of course this won’t fail. Electric cars will be the norm. Buying a supplier will eliminate a 3rd party’s profit margin from your own costs, also, of course it will work, people have been doing it for centuries. Bravo for Tesla and SolarCity. Hope they both do well.